By now, most conscientious builders and designers know that ducts, furnaces, and air handlers belong inside a house’s conditioned space. 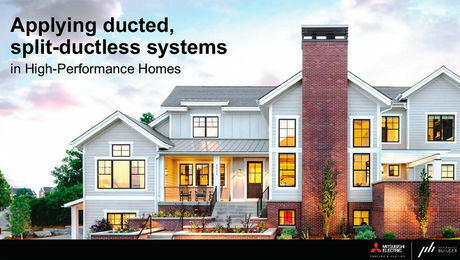 Researchers have shown that ductwork in unconditioned attics or vented crawlspaces wastes about 20% of the output of a furnace or air conditioner. If the duct system is unusually leaky and poorly insulated—or as occasionally happens, if some of the ducts are crushed, ripped, or completely disconnected—the energy waste will be far higher. The furnace or air handler’s location determines where ducts should be installed. The best locations for ducts are in insulated basements, sealed crawlspaces, or unvented conditioned attics. If these places won’t work, ducts can be installed in openweb floor trusses or in some type of soffit, dropped ceiling, or chase. • Any duct leaks will pressurize the joist bays, so be sure to air-seal the rim joist carefully to keep conditioned air indoors. • Order joists at least 16 in. deep to make room for insulation and ductwork. Account for this when designing stairs. • If you are building a tight, well-insulated house with high-performance windows, locate supply registers near the center of the house instead of at the perimeter. This will keep duct runs short. • Communicate and coordinate with the HVAC contractor, the plumber, and the electrician. These subcontractors will all be competing for the same joist space. 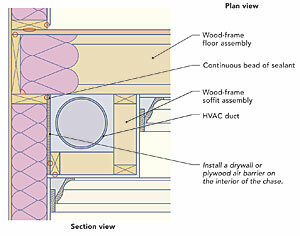 Make sure that duct chases don’t have any leaks or air pathways that communicate with the outdoors. Before any ducts are installed, the chases need to be lined with an airtight barrier—for example, drywall, plywood, or OSB with sealed seams. In a single-story home, it often makes sense to install ducts in soffits or in a dropped ceiling. This design works especially well in a house with a central hallway flanked by bedrooms on both sides. In a house with a more complicated floor plan, duct soffits can be built along the top of any wall. If the house is designed with 9-ft. ceilings, there will be plenty of room to lower the ceiling height where necessary. 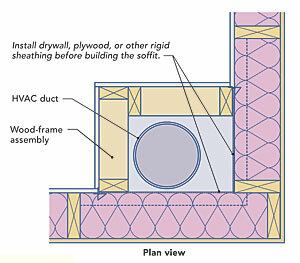 For this approach to work, you’ll need to air-seal the soffit before the ducts are installed. If the drywall crew can’t come to the site twice, the soffit will probably be sealed by the framers with OSB and caulk. If this step is done poorly, however, the house will have a major air leak. In single-story homes with a central hallway, it often makes sense to install ducts in a dropped ceiling. 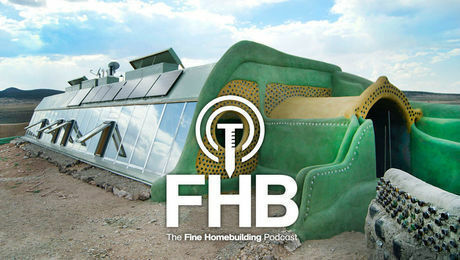 As long as the house has a high-quality thermal envelope, ducts don’t need to extend all the way to exterior walls. Another option is to recess ducts into the trusses. 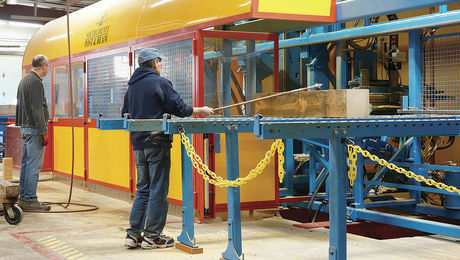 Most truss manufacturers can produce custom plenum trusses that include an integral duct chase. It’s possible to order special roof trusses, called plenum trusses, designed to accommodate a duct chase near the attic floor. The resulting chase is variously called a raised HVAC coffer and an inverted soffit. In a house that has an 8-ft. ceiling, these special roof trusses make more sense than site-built soffits. Like a site-built soffit, a chase within a roof truss must be air-sealed carefully before the ducts are installed, which means either that the drywall hangers and tapers have to come to the job site twice, or that your framing crew has to be trained to do the required air-sealing. These roof trusses create a bump in the attic floor, complicating the work of the attic-insulation crew. 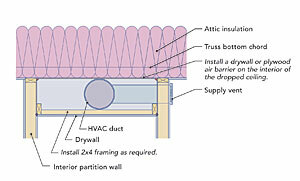 The chase’s walls may be vertical or sloping; in either case, protect the insulation on the walls of the chase with an attic-side air barrier. In years past, it was commonly assumed that as long as ducts were installed inside a home’s conditioned envelope, you didn’t need to seal the duct seams. These days, however, most energy consultants insist that HVAC contractors seal duct seams with mastic, even when all the ducts are inside the conditioned space. There are at least two good reasons for this practice. First, if ductwork is leaky, remote registers may get insufficient airflow, leading to comfort complaints. Second, duct leaks in soffits or joist bays can pressurize these hidden compartments, forcing conditioned air outdoors through cracks in the rim-joist area. Is all this work really worth the hassle? • It may be possible to downsize the air conditioner and furnace, which saves money. • Room-to-room temperature differences will probably be reduced, which improves occupant comfort. • Energy bills should be significantly lower. 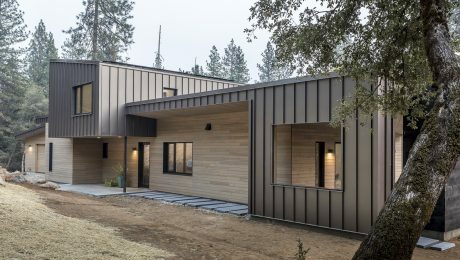 In spite of these obvious benefits, bringing the ducts inside the conditioned envelope is usually a headache for the builder, and the necessary details raise costs. Open-web trusses will probably cost more than I-joists, and deep joists may require a longer stairway. 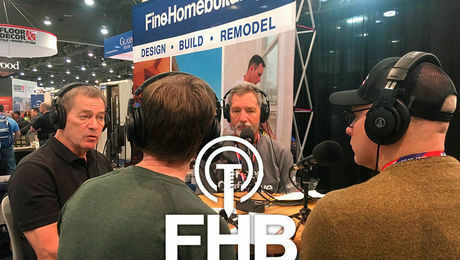 For a successful job, the general contractor will need to budget time for facilitating coordination between all of the trades, including the framers, the HVAC contractor, the plumber, the electrician, and the drywallers. These heavy-duty aluminum covers are the ideal solution for your beat-up or missing baseboard radiator covers. An industry veteran explains how to get the right gas fireplace for your home. Before considering PV panels, integrate passive strategies into the core of your home’s design to reap savings in heating and cooling costs.